Bali Spa There are luxurious facilities such as swimming pool, a sauna, and Jacuzzi, moreover, the villa of the spa has the traditional building-style of Bali which lets us enjoy the country side atmosphere of Bali. A spa product by the natural material and the heartfelt service of the therapists will be satisfied with visitors. Choose one from 4 kinds. Lulur is a ancient heritage from Indonesia which on the old times, is used only by kings on the kingdom's important occasion/event. Lulur is an effective way to lift up any soil and insensitive skin, loose unpleasant body odor, prevent wrinkles, create a shiny skin. The ingredients were made from wild ginger, rise, cinnamon, lotus seed, and other selective traditional ingredients. Nyuh Gading is a coconut fruit that are frequently used at religious event. It is very useful for the body to make your skin shinning, lift up any insentive skin, give good for the skin. It is made from coconut, lotus seed, green bean mixed with efficacious spices. Boreh is a very efficacious ingredients for Balinese people from the old times until the present time, which were used to loose any muscle ache, repair the blood circulation, prevent rheumatic, warm up body, release you from catching a cold. The ingredients were made from red rice, galingale and high puality spices. A photo session with the traditional Balinese wedding costume and make-up will make your day special. ★Car charter day option ＄ 40 More Cheaper! 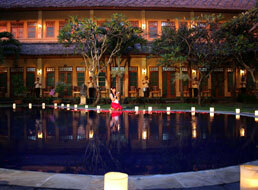 It will be on Tanjung Benoa Beach instead of Toya Spa. (Available from over 2 people and choice of the starting time between 9:00am to 2:00pm) You can go to enjoy Marine Pack or marine sports after the photo session. Balinese Costume on the Beach(2hours) ＄ 50 More Cheaper! *Dining time is approximately 30 minutes. *Package in our Jacuzzi, sauna, steam include. If you wish, please have a swimsuit. Treatment for Body, Head, Face. It is recommend for mens customer too. You can change Cream Bath to Shirodara with Additional ＄5 . Please let us know. Take picture with wearing traditional costume and make up. Children can wait in the lobby or the treatment room. (The staff can watch them if necessary.) Some menus are available for children over age 7. Q：Can my friend and I book courses which have different hours? A：Yes,the one who finishes early can wait in the treatment room or the lobby. Q：Can we use sauna, jacuzzi and pool? A：It is free to use if you book over 3.5 hours packages or HIRO-Chan packages. Please, bring your swimwear. Q：If we book Balinese Costume with 4people, how many photos can we get? A：Total 40 photos (10 photos for each). A CD data will be provided for family guests. A：Yes, you can have photos taken in many different ways. The staff explained politely at the lobby, I can fully enjoy spa treatments. During treatment also when touching the face, therapist said politely “I’m sorry”, ”Are you fine?, etc. I also fully enjoyed the relaxation. After treatment I had lymphatic massage, my chronic shoulder stiffness was relieved.